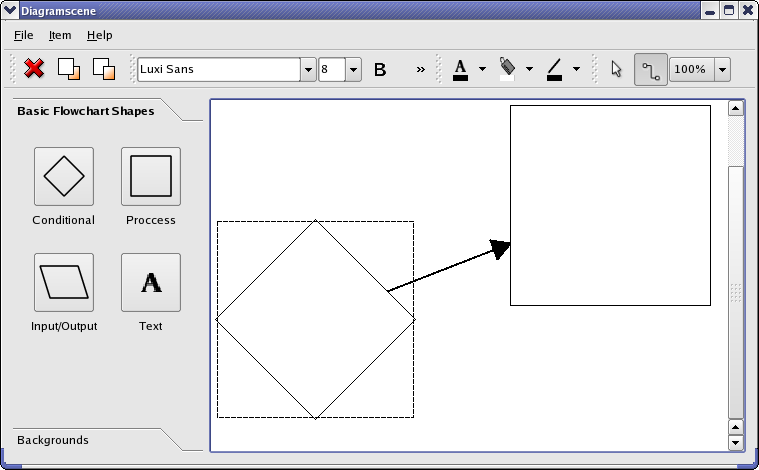 This example shows use of Qt's graphics framework. The Qt graphics view framework is designed to manage and display custom 2D graphics items. The main classes of the framework are QGraphicsItem, QGraphicsScene and QGraphicsView. The graphics scene manages the items and provides a surface for them. QGraphicsView is a widget that is used to render a scene on the screen. See the overview document for a more detailed description of the framework. This function returns a QWidget containing a QToolButton with an image of one of the DiagramItems, i.e., flowchart shapes. The image is created by the DiagramItem through the image() function. The QButtonGroup class lets us attach a QVariant with each button; we store the diagram's type, i.e., the DiagramItem::DiagramType enum. We use the stored diagram type when we create new diagram items for the scene. The widgets created with this function is used in the tool box. This slot deletes the selected item, if any, from the scene. If the item to be deleted is a DiagramItem, we also need to delete arrows connected to it; we don't want arrows in the scene that aren't connected to items in both ends. The pointerTypeGroup decides whether the scene is in ItemMove or InsertLine mode. This button group is exclusive, i.e., only one button is checked at any time. As with the buttonGrup above we have assigned an id to the buttons that matches values of the DiagramScene::Mode enum, so that we can use the id to set the correct mode. DiagramTextItems emit a signal when they loose focus, which is connected to this slot. We remove the item if it has no text. If not, we would leak memory and confuse the user as the items will be edited when pressed on by the mouse. The TextDiagramItem class inherits QGraphicsTextItem and adds the possibility to move editable text items. Editable QGraphicsTextItems are designed to be fixed in place and editing starts when the user single clicks on the item. With DiagramTextItem the editing starts with a double click leaving single click available to move it. Vi reimplement the functions that handle mouse events to make it possible to alter the mouse behavior of QGraphicsTextItem. DiagramScene uses the signal emitted when the text item looses remove the item if it is empty, i.e., it contains no text. We need to clear the selection, if any, and set the item selected as this is not the default behavior of QGraphicsTextItem. If we are editable, we want the QGraphicsTextItem implementation to handle the event; otherwise we want to make it possible to move the item. We do this by calling the QGraphicsItem implementation as QGraphicsTextItem is designed to be fixed in place. When we receive a double click event, we want the functionality provided by the QGraphicsTextItem::mousePressEvent() as this starts to edit the item. We cannot simply call that function with event as this is an event of type QEvent::GraphicsSceneMouseDoubleClick. We therefore create a new event object of the GraphicsSceneMousePress type that QGraphicsItem::mousePressEvent() expects. Since we created our own event object, we need to delete it our selves. If the line is selected we draw to dotted lines that are parallel with the line of the arrow. We do not use the default implementation, which uses boundingRect() because the QRect bounding rectangle is considerably larger than the line.